We Indian just love fusion-foods. We love experimenting different countries dishes with our Desi Indian Tadka to make it lip-smackingly delicious. Indians are very talented in every manner and when it comes to food then, you just cannot compare their talents with anyone else. We can serve the Thai, Italian or Chinese foods in the most Desi way by using Indian spices and tadka. We Indians have a great sense of taste, combining different spices and elements of foods to make a new dish. You can go anywhere in India and you will find some common cuisines that are not originated in India but you will not going to find it anywhere else except India. 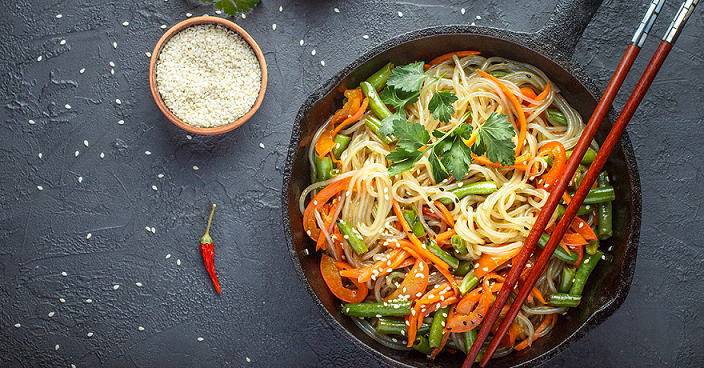 There are many local eateries and upscale restaurants and markets in the country that serves and offer a wide range of fusion foods, and one of the most common is Desi Chinese foods. So, let’s see the what are the delicious Desi Chinese foods that you must try in India which even the Chinese haven’t tasted. Chilli chicken is a popular and almost everyone’s favorite Indo-Chinese dish of chicken in India. It is a popular starter or appetizer from the Indo-Chinese cuisines. People love to have this with gravy or sometimes dry also. Boneless chickens are marinated in ginger garlic paste, hot chilli, and some spices, which is then deep fried in hot oil until turn reddish-brown and then, again seasoned with onions and green chilies, soya sauce, chilli sauce and pepper to get the best Chinese chilli chicken. People serve chicken chilli in two different style – Chilli Chicken with Gravy or Dry Chilli Chicken. India is famous for its extensive variety of vegetarian and non-vegetarian cuisines in all over the world. Manchurian is also an appetizer or starter dish from the Indo-Chinese cuisines and comes under both vegetarian and non-vegetarian cuisine. This can be made with veggies and meats. The non-vegetarian prepare chicken-Manchurian and for the vegans it’s veg-Manchurian that will cater all your snack cravings and will leave you wanting for more. It is made with deep fried vegetable balls tossed in Chinese spicy sauces. Most commonly Chicken Manchurian is prepared with boneless chicken Keema balls which is deep-fried in hot oil and then tossed in Chinese sauces. But, the veg-Manchurian is prepared with many vegetables most commonly the dumplings are made of carrots, cabbage, & spring onion. Well, there are many variations of Manchurian made with paneer, gobi, mutton and fish. Noodles! Yes, Chowmein is referred as Chow-Meing in China and is prepared with boiled noodles topped with greens, scrambled eggs and soya sauce. But, in India it is pan-fried, tossed in spices, green vegetables/chicken/eggs, soya sauce, tomato ketchup and chilli sauce. This is a very popular Indo-Chinese cuisine that you can find almost anywhere you are in India. It is a favorite dish of almost every household in India. Spring rolls are popular Chinese cuisine which is usually eaten during the spring festival in Mainland China. Spring rolls are a savory rolls which is prepared with cabbage and other vegetable fillings inside a thinly wrapped cylindrical pastry. These are crispy, sweet, delicious and rich in nutrients. The wrappers are filled with all kind of ingredients like carrots, peas, eggs, fish, shrimp, diced meat or dried tofu. But, in India you will commonly find Veg spring roll crunchy from outside with a spiced vegetable fillings from inside. A very common dish in every household in India is Fried Rice. Steamed in China and greasy and spiced with red chilli powder, garam masala and green chillies and other spices is what Indian style of Fried Rice. Whenever you will visit a restaurant and ordering from Indo-Chinese Cuisine then, Fried rice is the most common dish people order. Fried rice can also be both veg and non-veg. This fried rice is prepared with eggs, meats or green vegetables, which is tossed in soya sauce, chilli sauce, pepper and other spices. Dim Sums are a style of Chinese cuisine prepared as small bite-sized portions of food served in small steamer baskets or plates – Wikipedia. Dim sums looks like momos but are actually different from them. You may have ordered many times a plate of dim sums thinking that it is what momos are called in restaurants. But momos are actually quite different from dim sums and to know the difference you should order a plate of dim sums right now. The above are the most popular Indo-Chinese cuisines or simply say Desi-Chinese dishes in India that you will find nowhere else except in India. When it comes to Indian food we all have our favorite dishes from North Indian to South India but the Chinese foods – well it’s our national obsessions and you just cannot deny this fact.